George Hamilton was the son of James and Jane Hamilton. George was born in Killyman, Dungannon, County Tyrone. George served a 5 year apprenticeship with R Richardson, Dungannon. George then moved to Belfast where he work as a grocer’s assistant. George arrived in Sydney about 1912. George Hamilton enlisted on 8th August 1915 in New South Wales with Australian Infantry. 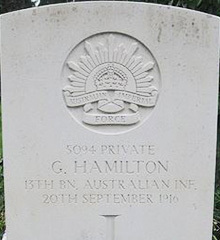 Private Hamilton was wounded in the field on 1 September 1916. He had a fracture right arm and an injured left ankle and was removed to the 3rd Canadian General Hospital. 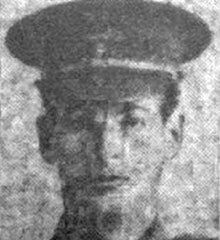 Private George Hamilton died on Sussex County Hospital in Brighton of a fracture humerus, amputation of arm and septicaemia on September 20th 1916. Between 1914 and 1919, the 5th Northern General Hospital, with more than 2,600 beds, occupied several buildings in Leicester and North Evington. More than 95,000 officers and men were admitted to the hospital, which recorded 514 deaths before its closure. During the Second World War, there was a Royal Air Force operational training station near Leicester.